Oikanys and I are happy to introduce MIDIbox ASIDITY: soon to be arguably the world's most powerful SID-based synthesizer! 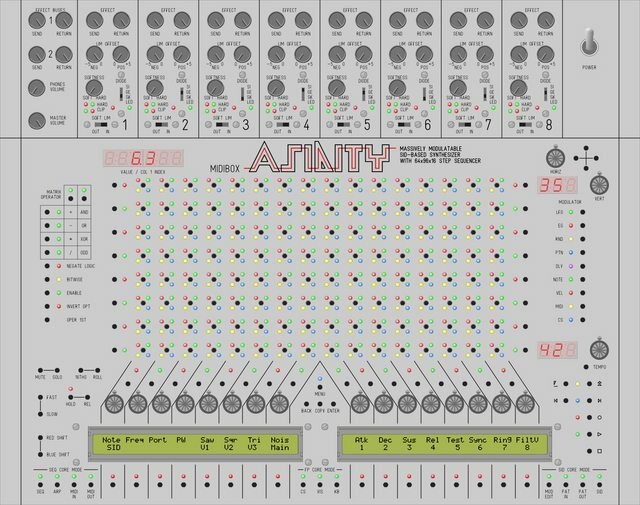 Designed with the mantra "MORE CONTROL" always in mind, ASIDITY harnesses the powerful versatility of eight Commodore 64 SID sound chips and one OPL3 using three LPC1769 cores. Featuring a digitally controlled feedback/volume/panning array, a massive modulation matrix (40 active and 198 passive modulators outputting to 512 SID parameters, 620 OPL3 parameters, and 424 modulator parameters), a powerful built-in 64-track 1536-measure morph sequencer that can control the SIDs as well as eight external MIDI outputs, an 8x16 four-color button/LED matrix that can run built-in adaptive visualizers when not being used, 35 knobs, over 240 buttons, and over 760 LEDs, ASIDITY will be awesome (if we finish it ;) ). - Control surface mode: Configure the knobs and matrix buttons to output values to 32 modulators, then place the control surface in CS mode and operate the controls to modulate things. This is not the only way to directly control SID parameters, though; in the modulation matrix edit screens, just turn the column knobs to edit the default values. - One 6-digit LED display and two 3-digit LED displays, to show parameter values, tempo, column numbers, etc. - Keyboard mode: rows are octaves, columns are note values. Transmits MIDI note on/off messages to Sequencer core as a separate port. Velocity and controllers can be controlled by knobs. - ASIDITY can be used as an eight-channel MIDI-controlled audio mixer with per-channel modulatable effects. Connect devices to SID external inputs and use SIDs' L and R outputs to mix and pan them. Activate SIDs' filters or feedback for effects. - ASIDITY can be used as a standard step sequencer. - Using loopback modulators and operators, simple digital logic circuits can be constructed in the modulation matrices of ASIDITY. - ASIDITY's modulation matrix is 239x1556, but calculating how many states it is capable of is difficult since a modulator can be connected to a maximum of 16 destinations, and a destination can have a maximum of 8 modulators connected to it. The number of possible states of connections to matrix outputs is on the order of 10^22, and to the inputs on the order of 10^53. This is the basis for our claim that ASIDITY will be the most powerful SID-based synthesizer in existence. However, at this point the numbers start getting pretty meaningless. Suggestions for more awesome features, and suggestions that the features we plan are impossible, are welcome. A project with high aims! Although you can re-use many routines which already exist, merging and enhancing will be a challenge. You will especially need some good debugging skills to keep an eye on the performance, and I'm sure that you will reconsider some features once you hear the first audible results. Hehe, good luck. Gonna be interesting to see the results! What's the time frame on the project? Well, I will be following this to see where it ends up! The reverb was actually an accident at first--we forgot we had effects enabled on that mixer channel. :) Also, this really was supposed to be a test program, and it wasn't really intended for playing: whenever it receives a MIDI note on message, it sets the frequency to that note and gates the SID, and whenever it receives any note off message it ungates the note. Hence playing legato is impossible with this test program--the stuttering in the video is due to that, not Oikanys playing badly. :) But that'll of course be fixed once I write the polyphony engine. We're college students in Maryland, United States. Update: We've now tested controlling two SIDs from one core, to see if the code for simultaneously sending different data to different SIDs works (it does). 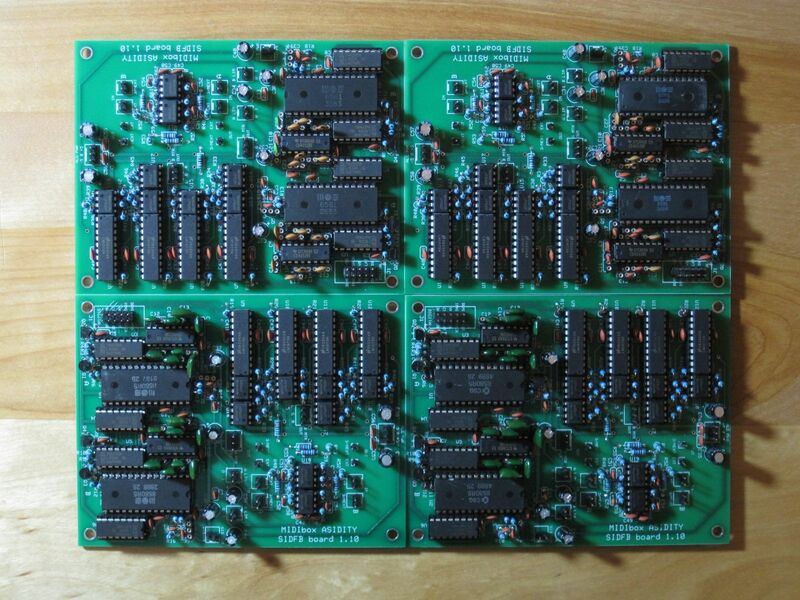 (It's basically eight MIDIbox SID modules, but instead of controlling the SIDs separately by CSing one at a time with eight CS lines, it sends different serial data to each simultaneously.) I wrote a small six-voice polyphony engine to demonstrate the independent control of all six voices, but this won't wind up in the final version. I didn't think this was worth making a video for; I hope to get the digitally controlled feedback working this weekend, and I'll make a video about that because that's really a new thing that hasn't been done before. We don't have a device with enough knobs to send controller changes to ASIDITY to control all these features simultaneously, so even we won't know what it's really capable of in terms of sound until the control surface is finished. For instance, in a 2-SID feedback loop playing originally from a pulse wave, we would have all the following parameters to control that could affect the sound: frequency, pulse width, envelope, cutoff and resonance in the generating SID, cutoff and resonance in the other SID, audio level from the first to the second SID, audio level from the second to the first, and L/R out for either or both. I can't wait for 32 customizable knobs! Edit: The audio attenuators did not work as I expected; they evidently need a balanced (+/-5 v) power supply or they will pop every time the level changes. We will be getting a power supply that can run everything in a couple of weeks, and then we'll see. +5v (digital) 3A or more for LEDs, SIDs, etc. The knobs at the top are for the limiters we're adding. They're switchable between whether they apply to each SID's audio input or output; they have adjustable hardness and separate positive and negative cutoff voltages, and four choices of diode for different harmonic profiles. There's also a much-higher-cutoff hard limiter that gets connected to whichever you don't connect the bigger limiter to. Also, we're considering throwing in an OPL3/YMF262 FM module. We already have the chip and DAC from an old sound card, and why not let ASIDITY's modulation power extend to a different kind of synthesis? In other news, as you can see from the subtitle, we're adding external SRAM to the sequencer core so it can do 64 tracks x 96 measures x 16 steps. We're also adding a delay modulator to the SID core: it simply delays an input modulation signal (not audio). Other than that everything is pretty much the same. I'm more than half done coding the SID core. I finally built the bipolar power supply and got the audio attenuators working. However, the digitally controlled feedback is currently lame; it just sounds like adding a little drive, there's no "screaming" feedback. I think this is because I have the op-amp for the audio attenuator configured as (at most) unity gain, so it's not actually amplifying anything. I'm going to change it to x2 gain, and if it sounds cool we'll put up a video. Here's a new video, showing off the digitally controlled feedback (3x gain)! We just ordered the custom SIDFB module boards. Each contains two SIDs, plus for each, a CD4052-based circuit to switch among four pairs of filter capacitors by digital control, and the six channels of digitally controlled audio attenuation/feedback. We will put up a video once we receive the boards, showing them off as well as our breadboard with 8580s (instead of the 6581s we've been testing with so far). Our front panel board arrived today--but for some reason they sent two! hey sauraen, the pcbs look very good, nice to see you are progressing with the build, looking forward to more progress and pictures/videos! A "Sid Synth" on the new Core LPC17, exactly what I've been waiting a long time! I finished one of the SIDFB boards today; I've been doing them in parallel, so the others will probably be done this weekend. 650 solder connections! This is quite the project but I'm incredibly excited to see it come to fruition! That SID board looks beautiful! You mentioned audio attenuators, so is that like a VCA type of thing? Edit: The limiters on the feedback loops are not on this board, but attached directly to their control pots on the front panel, connected where it says "A LIM" and "B LIM". We finished all the SIDFB boards! A video should be coming next weekend. By the way, there were too many bugs (and a mistake on the circuit board :bug: ) with the SID boards that I was not able to make a video last weekend.